: I was about 8 to to 0 years old. : I love his music, as must of all tennagers so it as a very different music, as with other rock and roll singers, but specially Elvis. 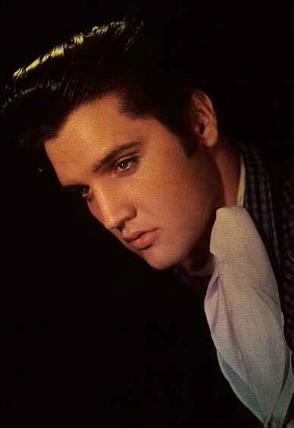 "My Message to Elvis": I would ask him why he did not take control of his carrer and let others manipulate him to the point of not finding more challenge to make his life going and push himself to the edge when he was so sick and still perform, why he let Col Parker push him the way he did, like in Vegas performing two shows a night. : King Creole is a movie where he showed the world he could have been a terrific actor if money would not have pose priority for Col Parker. the Song has lots of significance when it talks about friends. : Lisa Marie his daughter and his fans. : I was at work and I remember that everything came to a stop when we heard the terrible news. : Because of the carisma he had and the person he was, he never change his humble personality, and mostly and most important: He perform like no other performer had or will giving himself up in every performance, he was unique, and unique to his fans. We are still discovering music that was not relesed. : I like your site very much, and the only thing I can think of is a place where you can comment on certain things, I subscribe to EIN and I make comments on some of the books when I do not agree with them, for example I do not agree with the Memphis Mafia for writing the way they did about Elvis Life and later calling themselves their friends. Just that. Thank you for sharing your feelings with us in our survey. You are right Elvis is unique! Elvis was a warm and sincere man with real feelings, which are obvious in his music, his generosity was genuine, and the love for his fans was real. No matter what he was feeling or going through he never let us down. Now it`s up to us to honor and respect our legend, we are only able to do it through our feelings, giving to him in a small way for what he gave us to cherish forever` Long live his memory!!! !